Since 1970, the Armenian Relief Society (ARS) has been active in the United Nations. 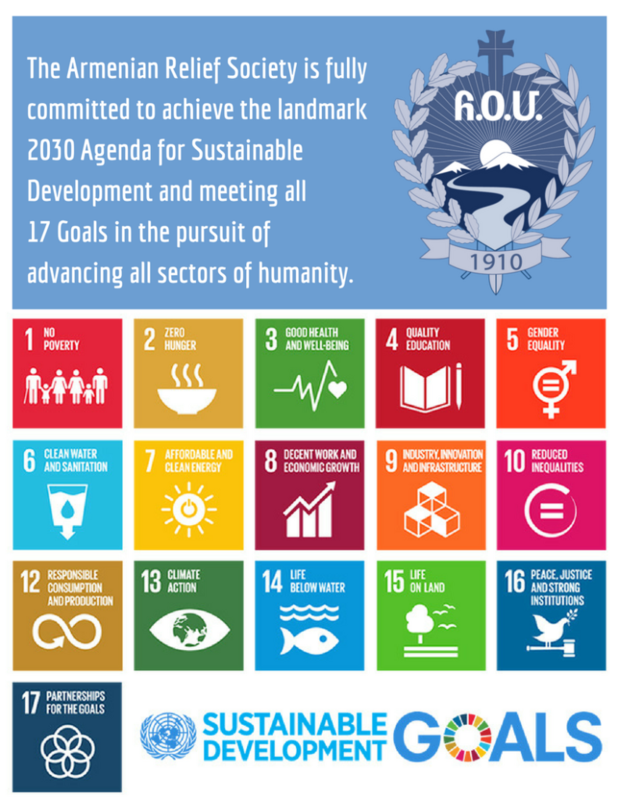 Firmly committed to the humanitarian credo of the Armenian Relief Society and the principles of the UN’s Universal Declaration of Human Rights, the ARS, as an internationally established Non-Governmental Organization (NGO) was admitted into the ranks of UN’s Economic and Social Commission (ECOSOC) on May 28, 1998 - by a happy coincidence on the very day of the 80th Anniversary of Armenia’s Independence. Through its active participation in various committees, ARS remains a champion of human rights, social justice, and universally endorsed values and principles. Presently, the ARS is involved in programs promoting world peace, particularly in the field of Human Rights. It supports the rights of minority groups, striving for self-rule, to achieve the necessary security guaranteeing them their dignity as members of a free society, free of the threat of aggression and the use of force in resolving conflicts. Based on these principles, the ARS will continue its activities in the UN, alongside its humanitarian work. The ARS has a worldwide presence in the UN with small teams who participate on a regular basis in various committee meetings or related functions at the UN Centers in Geneva, New York, and other locations. Through its active participation in various committees, ARS remains a champion of human rights, social justice, and universally endorsed values and principles. Reception at the Armenian Permanent Mission to the UN organized by the ARS. Attendees included Ambassador Arman Martyrosian, and his staff, Minister of Social Security, Aghvan Vardanian, Director of Lebanon’s State Statistics, Mrs. Maral Gidanian, ECOSOC’s Mrs. Hanifa Mezwi and their staff members. Agreement signed between the ARS and UNICEF to develop programs designed to reduce violence against women and children of socially vulnerable families in Armenia. Agreement signed between the ARS and the Medical School of the University of Massachusetts to initiate educational and preventive programs in the ARS “Mother and Child Health and Birthing Center in Akhurian, Armenia to combat the spread of HIV/AIDS in the country. The AIDS Foundation was approached and a sum of $51,000 was secured for the project. The ensuring program was extended with an additional allocation of $10,000. ARS Secured a grant of $25,767 from UNDP to develop methods for the early identification of childhood disabilities in Armenia, in cooperation with UNICEF and the Ministry of Health.